The ballpoint pen is aptly named because the ball at the tip is the most important part of the pen. If the ball is held in place to tightly you won't get smooth lines. If the ball is held in place to loosely you'll get extra ink on the page. If that ball falls out completely then nothing will be holding the ink in at all and you'll get a great flood of ink in your pocket, on your desk, or all over your important documents (it happened here at the office). Ballpoint pen technology has come a long way since it was first patented in 1888, but it still relies on a ball held in place perfectly to create your ideal lines. 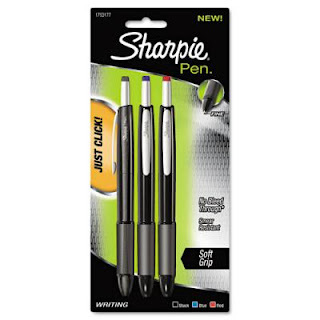 If relying on a metal sphere that's measured in millimeters isn't your bag of tea then I'd recommend you look at Sharpie's line of pens. These aren't the same Sharpies that your Mom used to label your T-Shirts in High School, but they do use the same tried and true porous tip technology that all markers have relied on for generations. These pens write just as you'd expect them to. Just be careful to make sure you remember to click the pen again when you are done using them. These aren't standard pens, and just like markers once the tip has dried out you'll greatly decrease the usefulness of the pen.